I love the way these daily draws show up as a continuation of one 'story' - the way that they follow on from one another never ceases to amaze me. When I wrote yesterday's post, I mentioned that some of the best ideas come while we are engaged in mundane tasks. One of the examples I used was walking the dog. A while after writing my post I was indeed walking my dog when I had an interesting and exciting idea for the future! It was something I hadn't considered before but it felt right and I decided there and then that - in due course - I'd see what might become of it. Immediately afterwards, I turned the corner as a clean and fluffy white feather landed right in the middle of the muddy path. As recently as a year ago I'd have ignored this, however I've read 'The Universe Has Your Back' and 'Big Magic' so I picked it up and put it in my pocket. I kept thinking about the idea last night, but I didn't do anything at all about it, due to the timing not being right. Still, I was feeling pretty excited about looking into it further. [I]deas spend eternity swirling around us, searching for available and willing human partners... When an idea thinks it has found somebody - say, you - who might be able to bring it into the world, the idea will pay you a visit. It will try to get your attention. - Elizabeth Gilbert, Big Magic. This morning, as I scrolled through my Facebook feed I saw a post showing the very thing I would need in order to implement the idea. The timing and location were all wrong, but I chuckled to myself to see this appear so soon after being open to it. It definitely felt like what Carl Jung called a 'synchronicity', and Liz Gilbert calls Magic! [S]ometimes - rarely, but magnificently - there comes a day when you're open and relaxed enough to actually receive something. Your defences might slacken and your anxieties might ease, and the magic can slip through. The idea, sensing your openness will start to do its work on you... It will organise coincidences and portents to stumble across your path, to keep your interests keen. You will start to notice all sorts of signs pointing you toward your idea. - Elizabeth Gilbert, Big Magic. Which takes me onto today's card. It's been a while since I drew from The Good Tarot so I picked it up, gave it a good shuffle, and found myself chuckling again at the image on the card I selected. 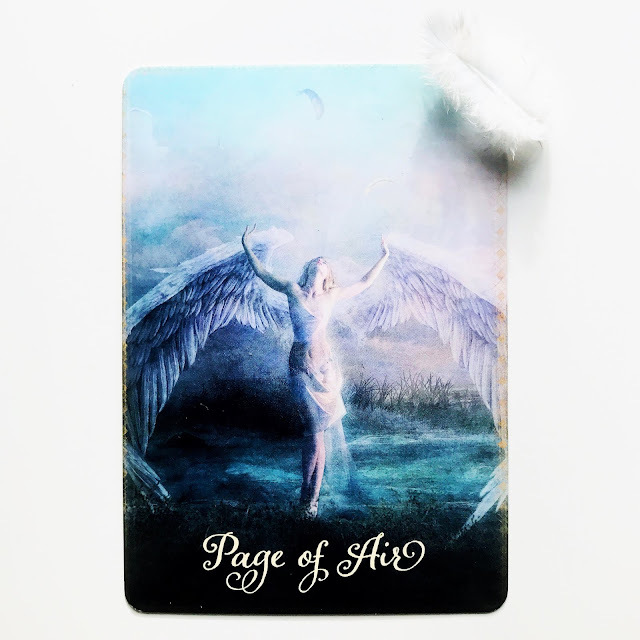 The Page of Air (Swords) is literally receiving a new idea from the ether and it is represented by a WHITE FEATHER! So on a personal level, I know exactly what today's card relates to. However, my intention was to select a card for a more universal message which would apply to you too. Does it? What new ideas are you curious about? Are you open to seeing things differently? Have you already started experiencing synchronicities that are nudging you in the right direction? I'd love to know so please feel free to leave a comment if this message also has any meaning for you too!